Who says the Bulls aren't ready for 2012-13? How about Martin Luther King, Jr. Day on January 21st at home against the Lakers? Nah, too early. What about the Heat’s first trip into the United Center right after the All-Star break February 21? Probably still too soon. OK, what about Derrick Rose playing his first game of the 2012-13 season at home Saturday, March 2 against the Brooklyn Nets and C.J. Watson, who now thinks Deron Williams is the league’s best point guard? That’s going to be the question every week for the Bulls once the midway point of the 2012-13 season passes. When will Derrick Rose return from ACL knee surgery, and how often? Perhaps the NBA was thinking that way as well as the Bulls’ new schedule is loaded with marquee games in the second half of the season, the Bulls playing all their games against the Heat after New Year’s, facing the Lakers in late January on Martin Luther King, Jr. Day and early March and closing the regular season with road games in Miami and Orlando before returning to host Washington April 17 to end the regular season. Will Derrick be ready by then? Will he be 85 percent, 95 percent? Playing at all? 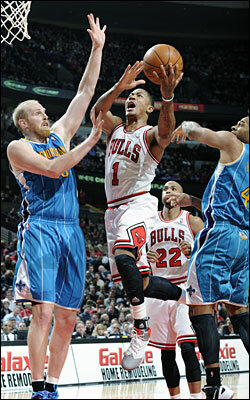 Those are some of the most pertinent questions for the Bulls as the NBA Thursday night released the 2012-13 schedule. The Bulls will open on Halloween, October 31, at home against Sacramento and play six of their first seven games at home before the circus jaunt. The Thunder will be the marquee team on that initial home stand Nov. 8. Also, the Bulls get their first look at No. 1 overall pick, Anthony Davis from Perspective Charter High School early with a home game Saturday Nov. 3, the third game of the season. Actually, the Bulls have a relatively benign schedule with no especially long road trip. The traditional road trip in November is just four games out West to Phoenix, the Clippers, Portland and Houston and the first look at Rockets center Omer Asik Thanksgiving eve. The trip then concludes in Milwaukee Saturday Nov. 24. The “Ice Capades” February trip is five games, but only two in the Western Conference. The Bulls open in Milwaukee Jan. 30 and then go to Brooklyn for the first time Feb. 1, Atlanta and then Denver and Utah over a relatively leisurely 10 days. Then the Bulls have a third Western Conference trip in March, three games in six days against the Lakers, Kings and Warriors. 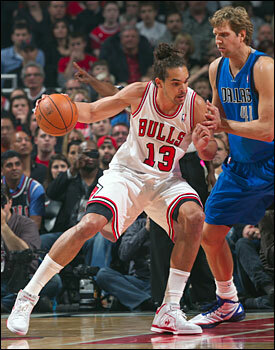 The Bulls only have single day trips to San Antonio and Dallas, thus no extended Texas triangle or two-step trip. Overall, the Bulls have 19 back to back sets, which is a fewer than they generally have in an 82-game season. The only negative from the Bulls perspective is 10 are home/road, meaning the lost hour generally traveling east after home games. Even likely without Rose, the Bulls are scheduled to play on Christmas Day. The Bulls will host the Rockets on Christmas. The Bulls open on Halloween and then play on holidays, New Year’s Eve (Charlotte) and Easter (Detroit), all at home. As mentioned, they play on King Day and for those of a different faith, the Bulls play on the start of Hanukkah and Passover, though the latter on the road in Washington. The hope is the administration at that point isn’t afflicted with painful boils or frogs. Though the vote could be 51-49. In reunions, the Bulls see Kyle Korver Dec. 22 in Atlanta, Asik on Thanksgiving eve Nov. 21 on the road, and C.J. Watson Dec. 15 at home in Brooklyn’s first visit. Ronnie Brewer and the Knicks are in Chicago Dec. 8. The Bulls will also get an early measuring stick look with Boston in the United Center Nov. 12 in the last game before the Western Conference trip. The Magic is in Nov. 6, and perhaps Dwight Howard by then will want to be traded to the Bulls. The Bulls return from that November Western trip for four games, culminating with the Pacers at home and then a short two-game road trip to Cleveland and Detroit before seeing the Knicks in the United Center. That first five weeks should give the Bulls a good idea where they stand in the conference without Rose in seeing the top contenders other than Miami. The Bulls’ first game with the defending champion Heat is Jan. 4 in Miami after playing in Orlando Jan. 2. The Bulls don’t have a road trip longer than five games, which is a rarity. They’ll play in Oklahoma City Feb. 24 after a stop in Charlotte. The Bulls also play the Heat at home March 27 in addition to the Feb. 21 United Center game. The Bulls play Sunday games perhaps on national TV April 14 at Miami, April 7 at Detroit, March 31 in Chicago against the Pistons, March 24 in Minnesota, March 10 at the Lakers, March 3 at Indiana and Feb. 24 in Oklahoma City. The season officially opens Oct. 30 with the Celtics at the Heat and the Mavericks at the Lakers and Steve Nash. And Howard? The Wizards and Cavs are the third team to play opening night. On Christmas Day, it’s the Celtics vs. Nets, Knicks vs. Lakers, Thunder vs. Heat, Rockets vs. Bulls and Nuggets at the Clippers. Jeremy Lin goes back to New York Dec. 17, Joe Johnson is in Atlanta Jan. 16, Jason Terry is in Dallas March 22, Steve Nash is back in Phoenix Jan. 30 and Ray Allen returns to Boston March 18.